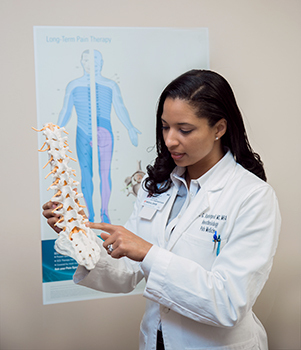 The University Center for Pain Management has expanded its capabilities under the direction of Stephanie Vanterpool, MD, MBA, Assistant Professor of Anesthesiology's Division of Pain Medicine, to offer comprehensive chronic pain management. Previously the center focused only on interventional treatment methods for acute pain through procedures such as epidural injections or other nerve blocks. 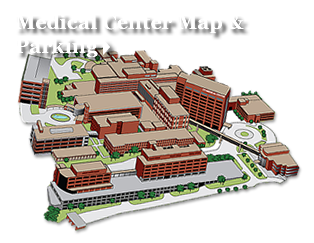 Now, the center offers an individualized approach for chronic pain patients where the root causes of pain are identified and a targeted treatment plan is established that may include multiple modalities with the goal of restoring relief and function to the body. Dr. Vanterpool said, "Our patients will have a complete evaluation to find what is causing the pain. We offer a wide range of procedures, with or without image guidance or sedation, and our treatment plan may or may not continue past treatments. Through a comprehensive approach, treatments ranging from medications to injections to physical therapy are designed to work together to get better results than using one method alone." She emphasized that medication will not automatically be incorporated into a treatment plan and that when it is, it will follow responsible medication management based on state guidelines. The expansion of the center is also benefiting resident education. Dr. Vanterpool said it is novel for Anesthesiology residents to be exposed to comprehensive pain management in addition to interventional methods. Through a dedicated rotation, residents gain experience in clinical evaluation, medication management, and procedures. Additionally, Dr. Vanterpool says the clinic will provide research opportunities. Currently, Ralph Lydic, PhD, Professor and Co-Director of Anesthesiology Research, is collaborating with Shawn Campagna, PhD, Associate Professor and Director of Biological and Small Molecule Mass Spec Core with UT's Department of Chemistry to identify biomarkers for pain. Dr. Vanterpool has previous experience establishing a pain management center. She recently earned her MBA from Duke University. Prior to that, she completed her Anesthesiology residency at the University of North Carolina at Chapel Hill in 2009 and a Pain Medicine Fellowship at Wake Forest in 2010.